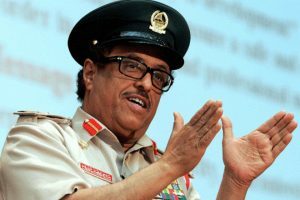 Dhahi Khalfan, head of Dubai security has urged Qatar to give up its plan to host the 2022 football world cup tournament and it will see the diplomatic row opposing it to Saudi Arabia, United Arab Emirates, Bahrain and Egypt over. Khalfan took to twitter to make the request, which alludes to the 13 conditions imposed by the four before normalizing ties with the tiny gas-rich country. The quartet early June cut off ties with Doha accusing it of supporting terrorism. As to the 13 conditions, they demanded that Doha reduces ties with Tehran, suspends military cooperation with Ankara, and shutters down Al Jazeera news network. At the beginning of the crisis, the Saudi-led quartet pressured the football governing body FIFA to deprive Qatar from hosting the event. Khalfan’s remarks came following a report by Cornerstone Global, a management-consulting group, pointing out that Qatar may not go ahead with hosting the global tournament because of its isolation. The report titled “Qatar in Focus: Is the FIFA World Cup 2022 in danger?” claims that tournament insiders and regional experts say that it is uncertain whether Doha will go on to host the competition. Doha, through the voice of Qatar World Cup supreme committee brushed aside the claims while noting there is “no risk” of the event being cancelled and that construction is continuing at only “minimal” cost increases. Qatari authorities have expressed doubt about the fairness of the report as Cornerstone Global founder, Ghanem Nuseibeh took to tweeter last week to accuse Qatar of facilitating terrorism financing. Doha also believes that the report is based on anonymous sources and media reports. Khalfan is known for his criticism of other rival countries and his anti-Qatar positions. In 2014, he stunned the world saying that Qatar is the UAE’s “eighth emirate”. Written by: KanelkaTagba on October 10, 2017. Posted by KanelkaTagba on Oct 10 2017. Filed under Gulf News, Headlines. You can follow any responses to this entry through the RSS 2.0. Both comments and pings are currently closed.